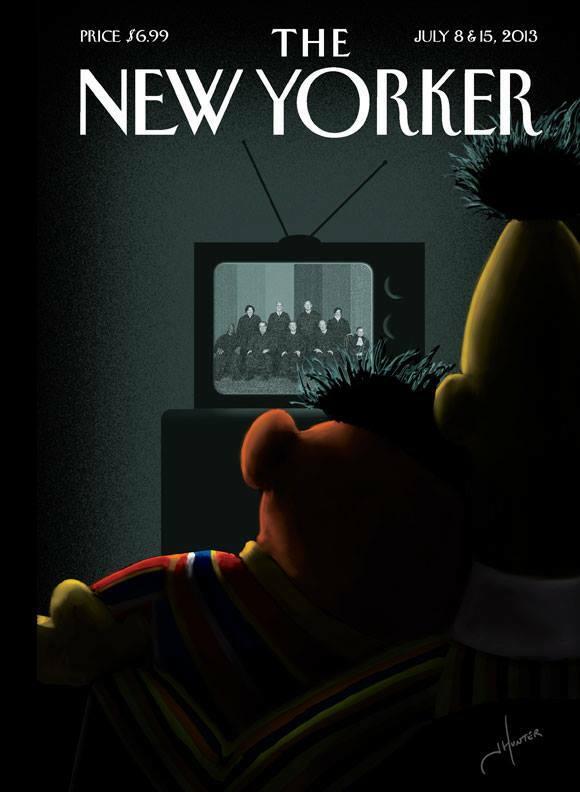 From The New Yorker website. 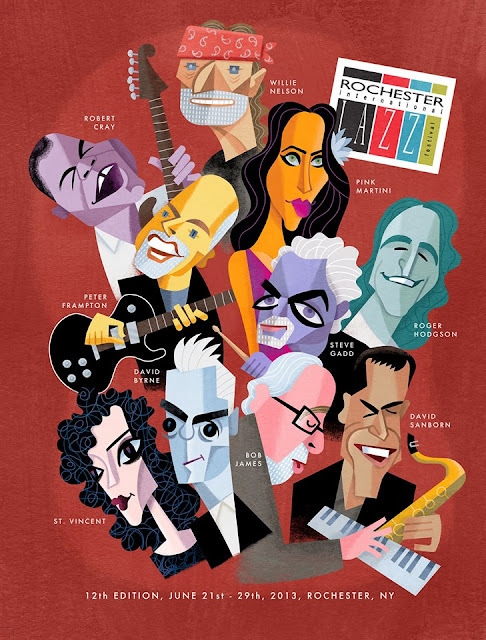 From the Desk of Bob Mankoff. 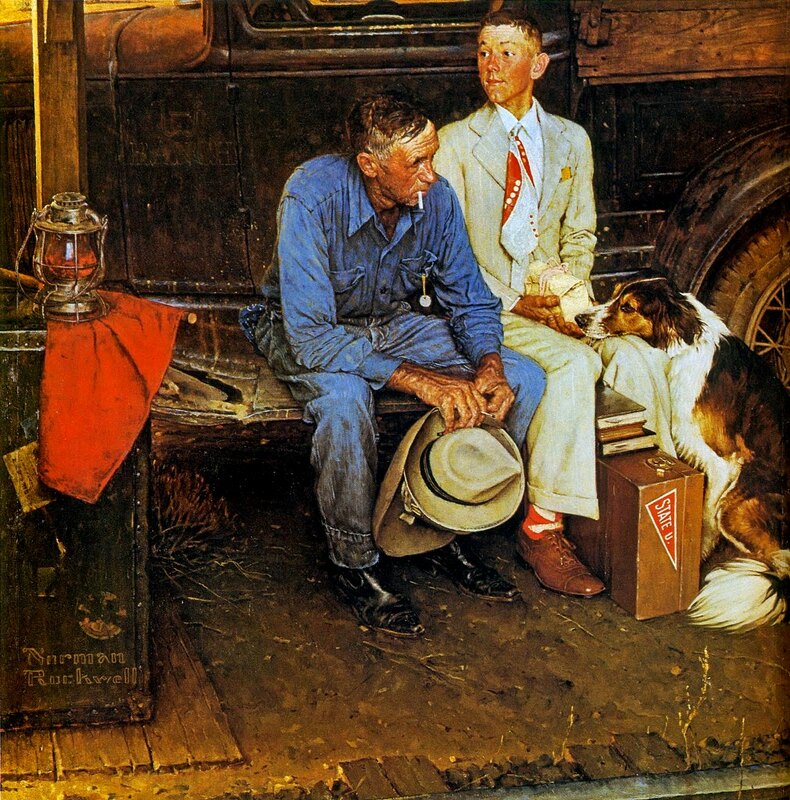 Hey, everyone, my air-conditioning went out, and it’s just too hot to write. Fortunately, I don’t have to fling my sweaty fingers around the keyboard doing my usual cartoonologizing shtick, because courtesy of the good folks at TED, that shtick is personified, in the person of me, in a talk called “Anatomy of a New Yorker Cartoon.” Go enjoy it, while I try to find an electrician. From Clown Crack (via Mike Lynch Cartoons). 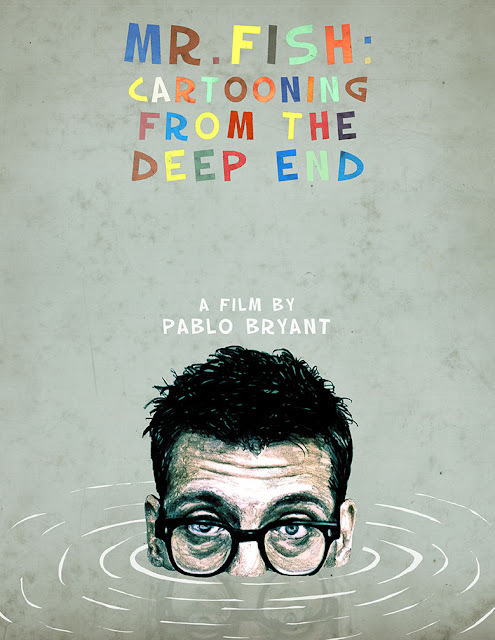 Filmaker Pablo Bryant has begun work on a new documentary about cartoonist Mr. Fish, whose work appears in Harper's and TruthDig.com. Tom Wharton in The Salt Lake Tribune. Don’t tell political cartoonist Matt Wuerker that he works in a dying business or that the traditional print form of lampooning is an endangered species. 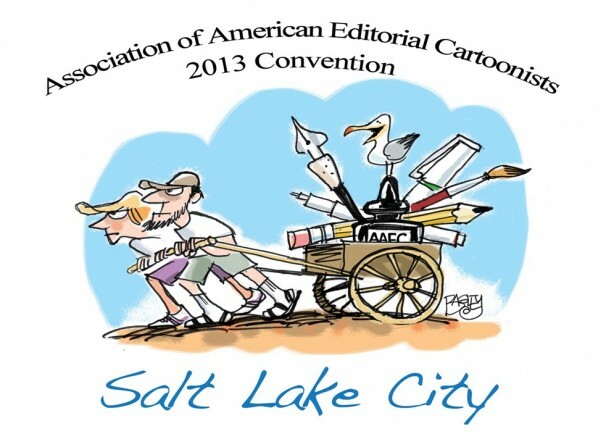 Salt Lake Tribune cartoonist Pat Bagley will be hosting this year's AAEC Convention from June 27-29 in Salt Lake City. 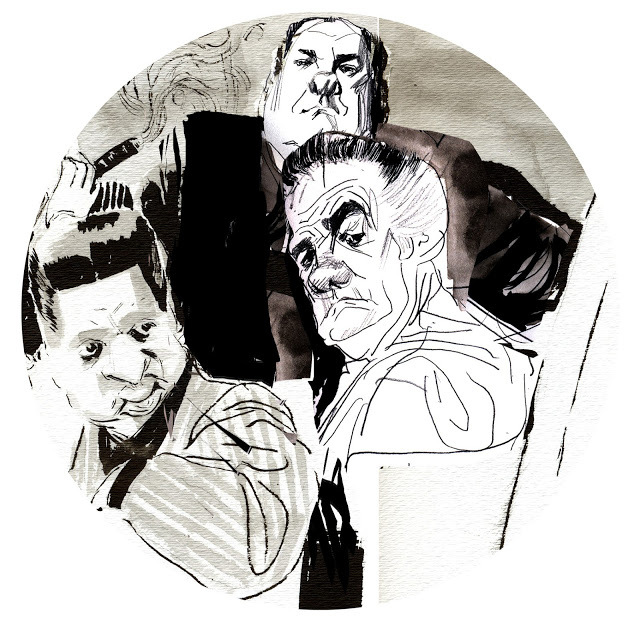 ... this wonderful caricature of James Gandolfini by Fred Sebastian. Daniel Finnan and Nick Champeaux on Radio France International. 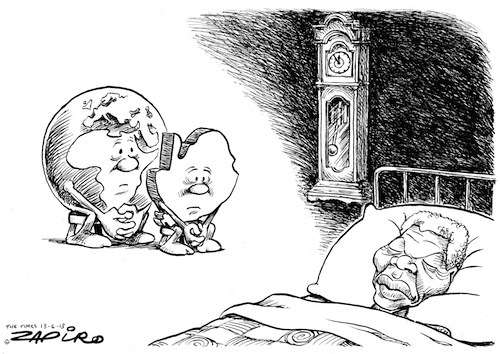 Hanging onto Nelson Mandela is not helping South Africa, satirical cartoonist Zapiro told RFI as the anti-aparthied leader spent his 11th day in hospital Tuesday. Referring to a meeting five years ago, Zapiro says the former president was “not as lucid” as he had been before, he is not a “full person”. Gary Groth in the Fantagraphics website. Photo by Alex Chun © 2013. 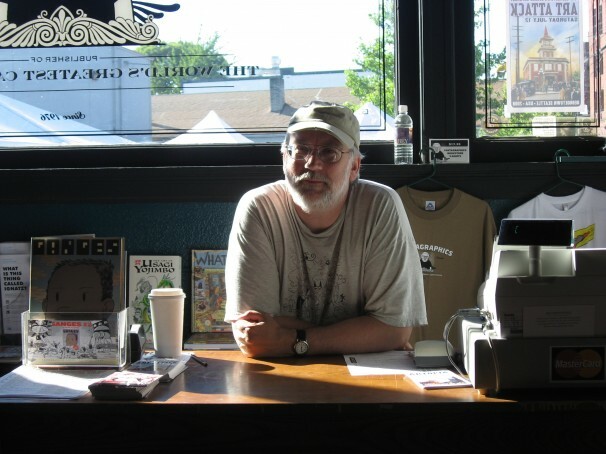 Fantagraphics co-publisher Kim Thompson died at 6:30 the morning of June 19. "He was my partner and close friend for 36 years," said Gary Groth. 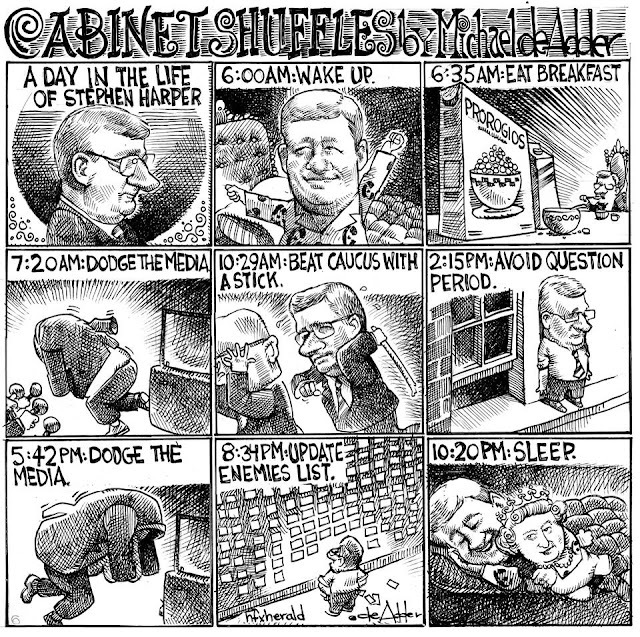 Editorial cartoonist Michael de Adder’s saucy Cabinet Shuffles is back. Universal Uclick, home to many of the world’s most notable cartoonists and columnists, is proud to announce an exclusive syndication agreement with Pulitzer Prize-winning editorial cartoonist Matt Davies. Davies is the eighth creator currently represented by Universal Uclick who has won a Pulitzer Prize. 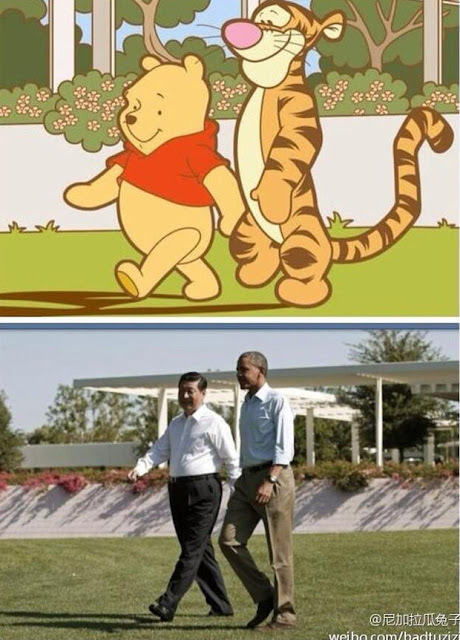 Chinese internet censors are up in arms as bloggers note uncanny resemblance between Winnie the Pooh and China’s president. Daniel Grant in The Wall Street Journal. 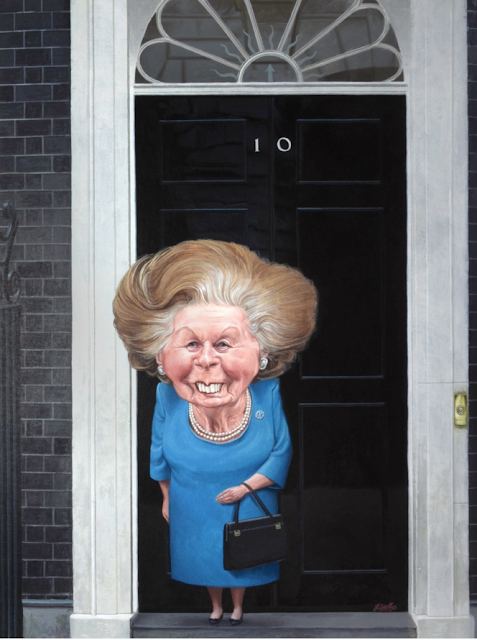 An exhibition of Margaret Thatcher cartoons, The Eyes of Caligula and the Lips of Marilyn Monroe, opens today at the Chris Beetles Gallery in London and will run until June 22. The gallery is promoting the event with the caricature above by Procartoonists.org member Jonathan Cusick. 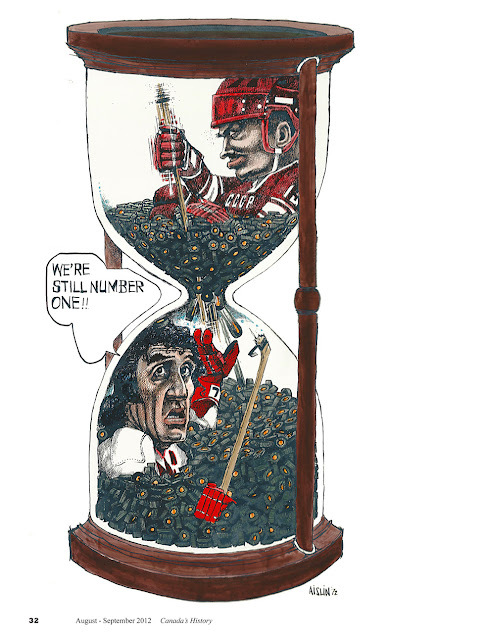 The exhibition features cartoonists Jak, John Jensen, Larry, Ed McLachlan, Matt and Peter Brookes. Ottawa edition of legendary publication is returning online after a five-year hiatus. 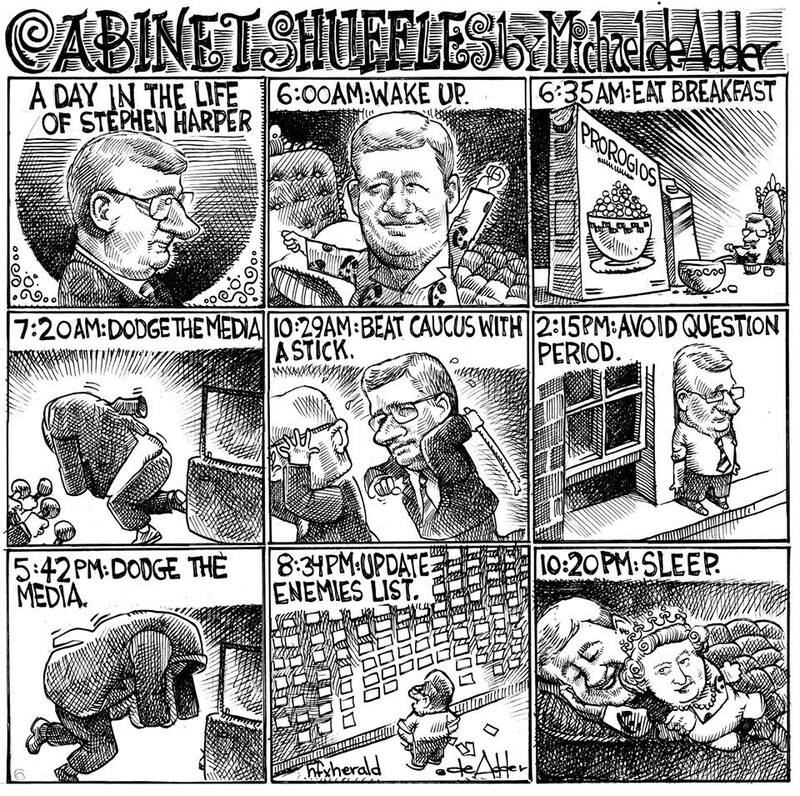 Terry Mosher (a.k.a. Aislin) won the gold award in the Words and Pictures category at the 36th National Magazine Awards yesterday for the following article published in Canada's History Magazine. In 2000, King Features launched Six Chix, a daily comic strip created by six women. I was one of the original “Chix” and my designated day was Thursday. The color Sunday strip was rotated between all the cartoonists. I was a bit ambivalent about the whole thing; while I enjoyed the opportunity to create cartoons which weren’t purely editorial, the gimmick of a strip by six women set my teeth on edge. There wasn’t a reason why any of the Six Chix contributors shouldn’t have been offered a strip on their own; can you imagine syndicates even approaching male cartoonists with this idea? Just for Laughs is proud to once again be teaming up with artist and designer Constantin Marinescu, who has been creating a unique brand of visual humour for more than five decades, as the Director and Artistic Director for the Just for Laughs 2013 International Visual Arts Contest. It is also proud to be have Montreal’s URBANA Marketing organizing the event. After the Funny Story in 2001, the Joke in 2002, Irony in 2003 and Parody in 2004, Cynicism will be be explored this year. The Just for Laughs 2013 International Visual Arts Contest, presented within the Street Arts programming of Just for Laughs Festival, will culminate with an exhibition running from July 13-27th, in the heart of Montreal’s Quartier des Spectacles within Place des Festivals, in front of the Place des Arts entrance on Sainte-Catherine street. Entries from over 150 participants from at least three continents are expected, with 30 finalists and three winners announced during the vernissage. All artist applications must be received by June 17, 2013. 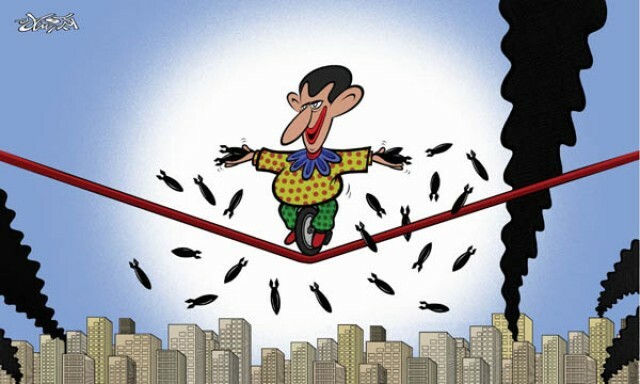 About six months ago Syrian cartoonist Akram Raslan disappeared in Damascus and was reportedly being held incommunicado by the Bashir al-Assad government. He had been drawing for the Al-Fida (or Fedaa) newspaper in the city of Hama when he was grabbed. Now. he is about to be put on trial.